When should a law firm redesign its logo? Probably never. It’s not uncommon to see a law firm’s brand become stagnant – and then *BOOM* – an entirely new look is unveiled that bears little or no relationship to the previous one. This type of sudden, massive identity shift is nearly always a mistake. Any logo that has been used for decades – even if it’s ugly and awful – possesses valuable brand equity. People have come to identify your firm by its look. And they are comforted by its familiarity. Let’s look to some of the most successful brands in history. Apple. Shell. Coca-Cola. Each of these powerful brands has for decades used the same marks – and enjoyed remarkable success and unprecedented brand identity. On the flip side, check out the 2009 logo and packaging redesign of Tropicana (above). 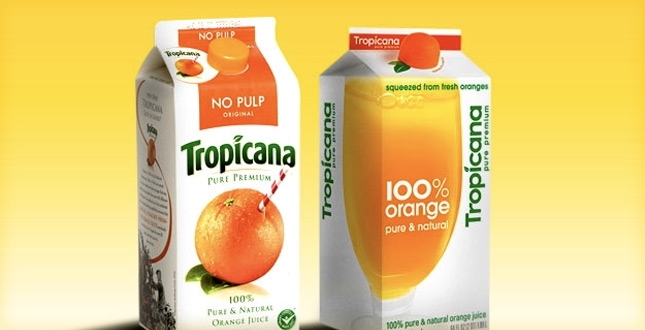 Tropicana’s goal in its redesign was to distinguish itself from look-alike competitors. This drastic new look was a sudden move – and customers weren’t ready for it. The public was so confused by the new packaging of its favorite orange juice, that parent company Pepsi Co. reverted to the tried-and-true logo shortly after the launch. Law firms often make the mistake of Tropicana. These massive, ill-conceived shifts breed client mistrust and confusion in the marketplace. A massive identity overhaul happens because a firm’s marketing team is intent on creating beautiful, cutting-edge marketing pieces – and they see the firm’s outdated identity as a barrier to achieving their goal. Although this is understandable (I’ve been there myself! ), sudden shifts in a graphic identity are seldom a good idea for the organization as a whole. Why? Because a known brand has value (i.e., brand equity) that gets squandered. Furthermore, it’s difficult and expensive (in many ways) to reintroduce yourself to the marketplace after unveiling an entirely new look. Effective brands are built slowly over time and upon past successes. Which brings us to another lesson that successful global brands can teach us: successful logos evolve and change. For BMW: Evolve with the times. BMW’s ever-evolving logo is a great example of how a spruce-up is necessary to keep legacy brands relevant to new customers. In nearly a century, the automaker has redesigned its logo a half-dozen times, always keeping the classic blue-and-white pinwheel emblem that is at the core of this stalwart’s identity, yet introducing a modern twist with each iteration. Is the BMW brand logo especially good? That’s debatable. But it’s also immaterial. The BMW brand has gained tremendous value over the years. If BMW were to scrap it, or even deviate too much from its current brand look, the company would risk serious harm to its future prospects. Smart brand facelifts often coincide with other shifts within an organization. For example, Marissa Meyers updated Yahoo!’s purple logo when she stepped into the CEO seat. The refreshed logo was different enough to signal new leadership and a different direction for the Internet giant. However, it wasn’t a massive shift that would cause brand confusion. However, sometimes it makes sense to completely scrap an old identity, in favor of a new one. Below are three examples of when to go for a full do-over. Exception #1: It’s awful and hasn’t been around too long. Take a look at the very first logos that Shell, Apple and Coke had. They were awful! Luckily, those companies realized it quickly. In the case of Apple, they introduced a new brand-look mere months after unveiling their first logo. If a logo and other brand design haven’t been around long enough to have gained significant brand equity, they won’t be missed. Exception #3: No Brand Equity If your logo has been changed so many times – and been implemented so inconsistently – that it’s difficult to identify, then starting from scratch may make sense. Does your logo have brand equity? So, is implementing a new logo / brand-look right for your firm? Before you bring in the brand design experts, it makes sense to think about brand equity. As much as you dislike what you’ve got, it might prove worthwhile to modify it rather than scrap it entirely. And keep in mind: even ugly logos can possess great value. Anthony – Thanks for your comment. The Nixon Peabody redesign certainly appears to be a sudden, massive change. That said, I’m reluctant to comment on whether a massive change was appropriate for Nixon Peabody because I know very little about the firm and why they redesigned their logo. For example, how long were they using the previous look? Was a radical logo resign signaling a radical change in direction for the firm? I have no idea. Perhaps somebody at Nixon Peabody can weigh in. I’d love to hear about their rationale. Thanks for the question, Anthony. Lauren, thanks for responding. I’d like to hear more — because it *seems* to me that Nixon Peabody did the exact opposite of what Dion is suggesting in his piece. Do you reject his logic? Or am I just not understanding enough of the story? Please explain. The BMW logo or ROUNDEL as it is known to BMW aficionados is based on a spinning airplane propellor against a blue sky. BMW began as an aviation engine manufacturer. After WW I when the Treaty of Versailles excluded Germany from building airplanes and Zeppelins, BMW found themselves needing to reinvent themselves and began by building motorcycles. Of course Germans were broke from war and the onerous treaty and couldn’t dream of buying automobiles. Motorcycles were the only vehicles anyone could afford. As the Germans shrugged off the Versailles Treaty in the 1930s and began to arm themselves, BMW began making aero engines again and BMW Electric Boat made the deadly submarines that prowled the Atlantic in the beginning of WW II. A little known fact about BMW aero engines is that Germany had a few vendors for aero engines early in WW II including Mercedes and Auto Union (AUDI). When the superior ME 109 fighter plane was made, the paperhanging idiot in charge sent the engine contract to Mercedes. It was fraud and greed in the basest sense and I’m so happy for it. Lucky for us and our Brit friends in their Spitfires, the BMW engines were not used because of this political fraud. We might be in a different world today had those fantastic BMW aero engines flew in the Battle of Britain. They would’ve given a run to even our Tuskegee Airmen in their Mustangs with their 12 cylinder Rolls Royce engines later in the war. The truth about BMWs LOGO is that it is very special to their loyal customers and represents a company that has always been innovative. The ROUNDEL represents high aspirations. Unlike a Saab story, BMW doesn’t brag about it’s aerospace background. They don’t have to. Most discerning consumers understand the history. And they then buy BMW’s superior products. I love the ROUNDEL- It reminds me of the freedom I enjoyed on my BMW before a wasp allergy “grounded” me forever on a motorcycle. Maybe a transcendent LOGO would’ve helped them sooner. Gene — thanks for providing us some background on the BMW logo. As for the Apple logo, they adopted the monochrome version in 1998 after the return of Steve Jobs. Abandoning their color logo — which had been used for over 22 years — signaled new thinking and new management at the company. A good firm marketing team, or marketer knows the value of consistency and brand equity. Have you found that marketing agencies see the prospect of creative innovation, awards and lots of dollars as a motivator to convince management over the marketing’s head to do something “fresh”? Simone – that’s a great question. Interestingly, we often find ourselves in the opposite scenario. It’s frequently the firm’s marketing team that wants a complete brand overhaul – and we’re often trying to get them to think about incremental improvements… I suppose that the desire to create portfolio-worthy pieces cuts both ways! It’s interesting to note that consumer product companies shy away from making big changes to their graphic identities because they fear that brand confusion will directly result in a drop in sales. But with B2B companies, (e.g. law firms) the negative effects of brand confusion are subtle – and therefore, the perceived low risk leaves the door open to the doing big, career defining, brand overhauls.